The Israeli embassy and the Jewish community of Senegal have donated 99 sheep to poor families in that country in honour of Eid al Kebir, a holiday that recalls the Koranic narrative in which Ibrahim was said to have sacrificed a sheep in the stead of his son Ishmael. 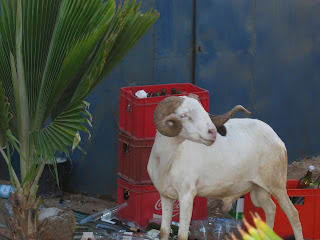 A sheep for the festival can often cost $150.00 to $600.00, a sum far beyond the reach of a poor family in Senegal, an African nation with a population that is about 95% Muslim. Voice of America reports as follows about the gesture from Israel and Senegal's Jewish community. "The Israeli embassy in Senegal and members of Senegal's Jewish community gave sheep to underprivileged Senegalese families on Tuesday so they can celebrate the Muslim religious holiday of Tabaski this weekend. Ninety-nine sheep waited for their new owners outside the donation ceremony in Dakar, just four days before Aid el Kebir, or Tabaski, as it is known in Senegal. On that day, Muslims around the world will sacrifice sheep and other animals to commemorate the prophet Abraham's willingness to sacrifice his son Ishmael as an act of obedience to God." In a country of ten million, such a gesture may seem small, but it is likely to inspire emulation. When well to do Muslims in the country see the action of non Muslims to assist them, it will probably attract attention to some of the charitable aspects of the holiday. There have been times in history when Muslims and Jews had a close working relationship. It was Muslim Turkey that offered haven to Jews fleeing the Spanish inquisition. Maimonides, the renowned Jewish scholar and physician was a doctor and adviser to the king of Egypt 800 years ago. There have been ups and downs in the history of Judaeo Islamic relations. Anyone who has been in Israel or traveled in Muslim countries is familiar with the full range of feeling in Judaeo Islamic relations, from the grim and hateful to times when there was warmth and cordiality. I sincerely hope that the warmth and good wishes of Senegal's Jews to its Muslim population are contagious. I wish my Muslim readers and neighbours Eid Mubarak ( a blessed festival) in their holiday.